Can you imagine being the grandchild of a celebrity? Each grandson and granddaughter on this list are the legacy of someone remarkable. 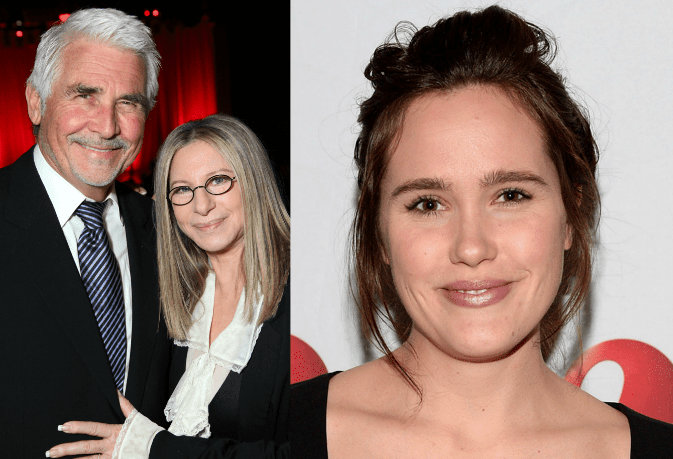 Whether it be an iconic movie star like Marlon Brando or award-winning novelist like Ernest Hemingway, these grandchildren all have one thing in common- they have pretty awesome grandparents. Having a super famous grandparent certainly has its perks. Not only can you brag about it to all your friends, but you also are most likely to win big in the gene pool. The grandchildren on this list have all inherited at least one valuable trait from their grandparents. Some of these (grown up) grandkids have been lucky enough to inherit their grandparent’s talent, stunning good looks and intelligence. For many on this list, being able to name-drop their famous relative has been a beneficial factor in launching a successful career of their own. 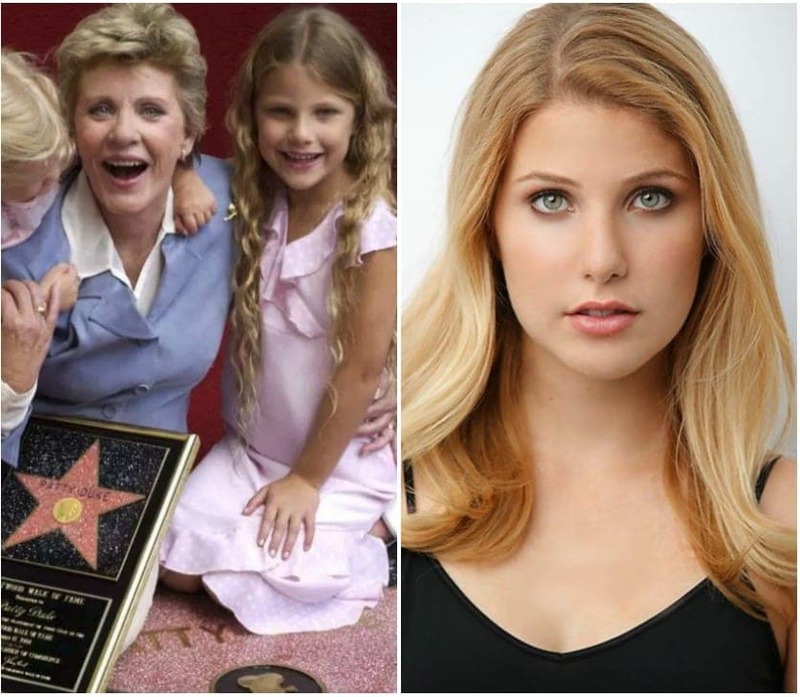 A majority of celebrity grandkids have taken advantage of their family name and are now working as fashion models, actors and actresses and musical performers. Others on this list haven’t been able to fully live up to their grandparent’s name and choose to stay low from the public eye. On the other hand, growing up as “Grace Kelly’s Granddaughter” or “Marlon Brando’s Grandson” can grow tiresome. In a world where we all just want to be independent and be in charge of our own success story, it can be difficult to constantly live under the limelight of a famous relative. It can also make it difficult to live up to such high standards that their grandparents set for them. This might be the reason why so many people decide to change their last name or hide their secret celebrity grandparent from the world. 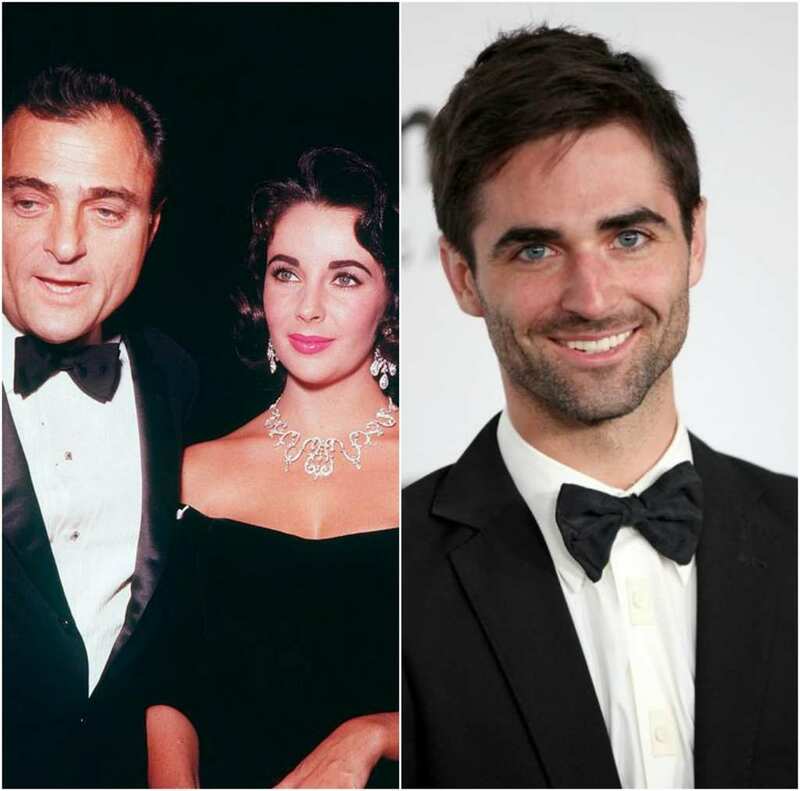 From Elizabeth Taylor to Elvis Presley, this is the complete list of grandchildren of famous celebrities. 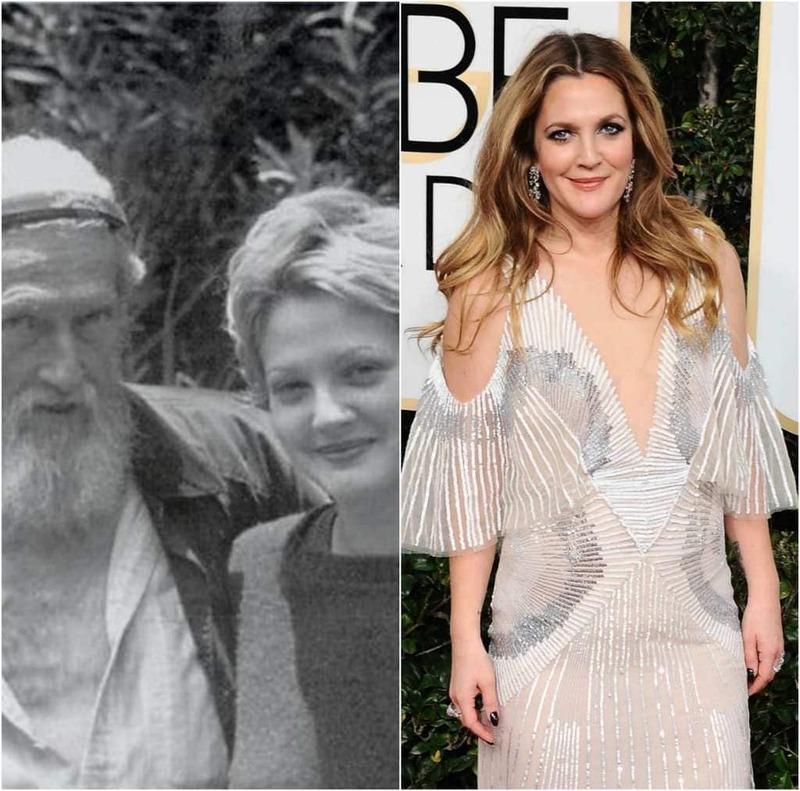 Drew Barrymore is no unfamiliar name in Hollywood. Even before we were watching the stunning starlet on the big screen, the Barrymore family was already making quite the name for themselves. 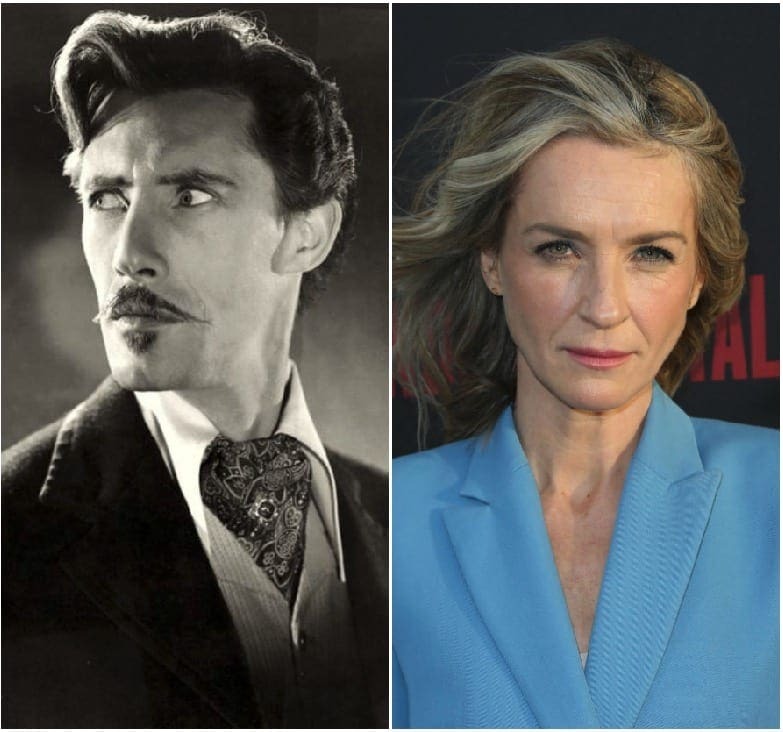 Drew’s grandfather, John Barrymore, played big roles in classic films of the 20s and 30s such as Grand Hotel, Dr. Jeckyll and Mr. Hyde and Sherlock Holmes, just to name a few. 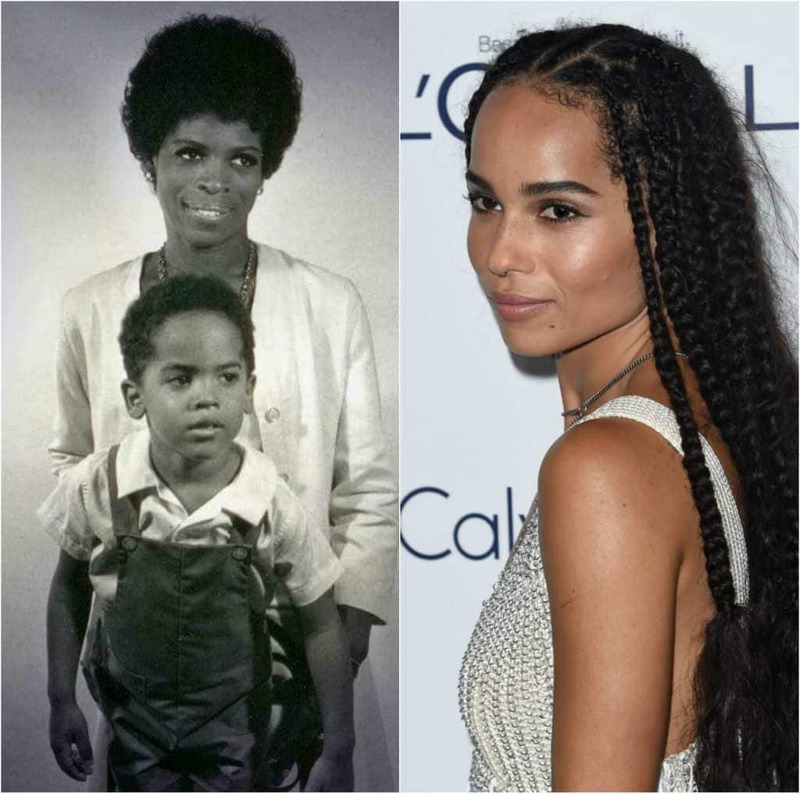 Now John’s granddaughter is considered an A-list celebrity herself, who nailed her first big acting role at the age of 7 in the movie E.T. Anne Gwynne was one of the most famous pin-up girls of the 40s. She was one of the first ever “scream queens” who became famous for her leading roles in horror films during that era such as House of Frankenstein and Weird Woman. Gwynne’s grandson, Chris Pine, certainly inherited her good looks. 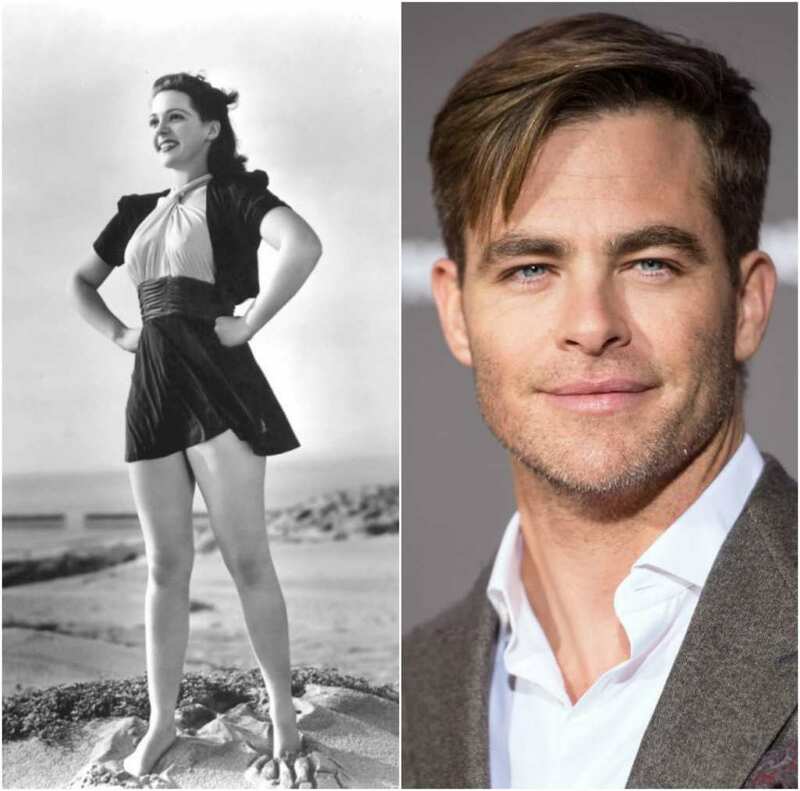 Pine followed in his grandmother’s footsteps and is now one of the hottest movie stars in Hollywood who is most famous for his recent roles in Wonder Woman and Star Trek. Walter Huston was a big name in the world of both Hollywood and Broadway. He played major roles in classic films throughout the 30s and 40s such as Abraham Lincoln and The Virginian. He took home an oscar in 1948 for his performance in The Treasure of the Sierra Madre. 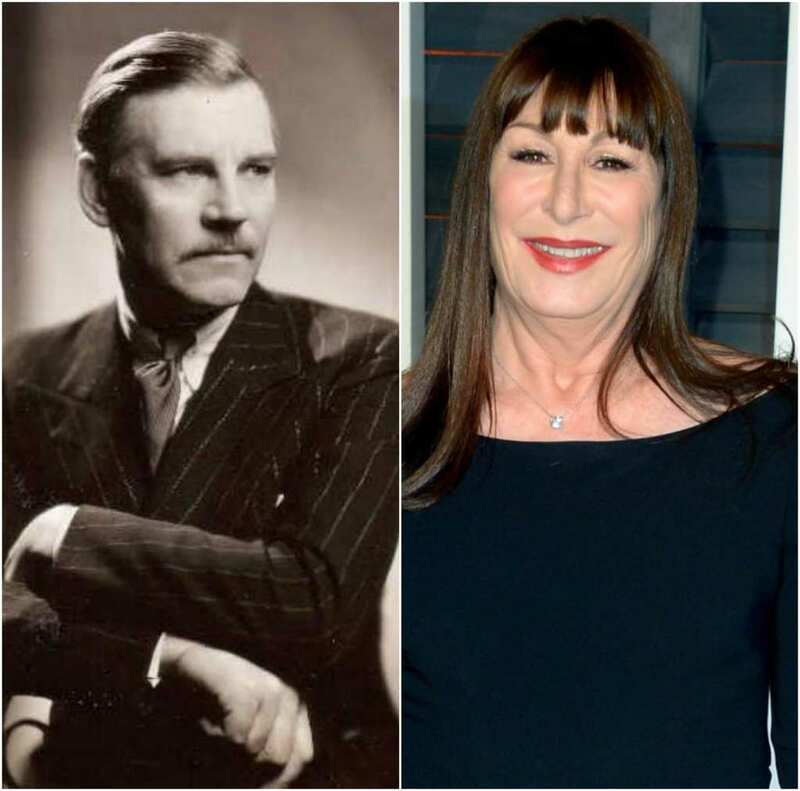 His granddaughter, Anjelica Huston is no newbie to Hollywood herself, and has starred in a large array of TV shows and movies such as The Addams Family and more recently the TV show Smash. Tex Ritter was a famous country singer and actor of the 30s through 60s who played in a total of 40 “musical western” films. Tex played a “singing cowboy” in films such as Hittn’ the Trail and Song of Gringo. 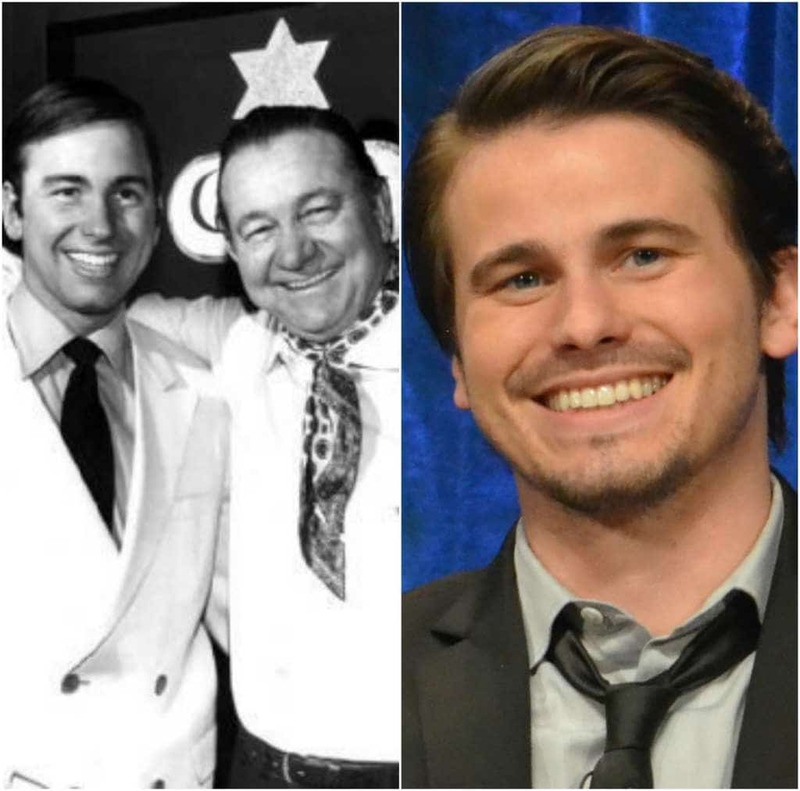 Jason Ritter, who is also the son of the late comedian and TV star John Ritter, has been keeping busy acting on stage and on screen. You may recognize him as the lovable English teacher in the TV show Parenthood. Elizabeth Taylor is known as one of the most beautiful movie stars of all time. She starred in a number of leading roles, her most famous as Cleopatra. Taylor’s grandson was lucky to inherit her lovely features and good heart. He is currently continuing his grandmother’s legacy of being charitable by acting as the co-trustee of The Elizabeth Taylor AIDS Foundation, which raises money in order to spread awareness and stop HIV/AIDS. Steve McQueen was breaking hearts with his “cool kid” nature throughout the 60s and 70s. He starred in classic titles such as The Great Escape, The Blob and Bullitt. 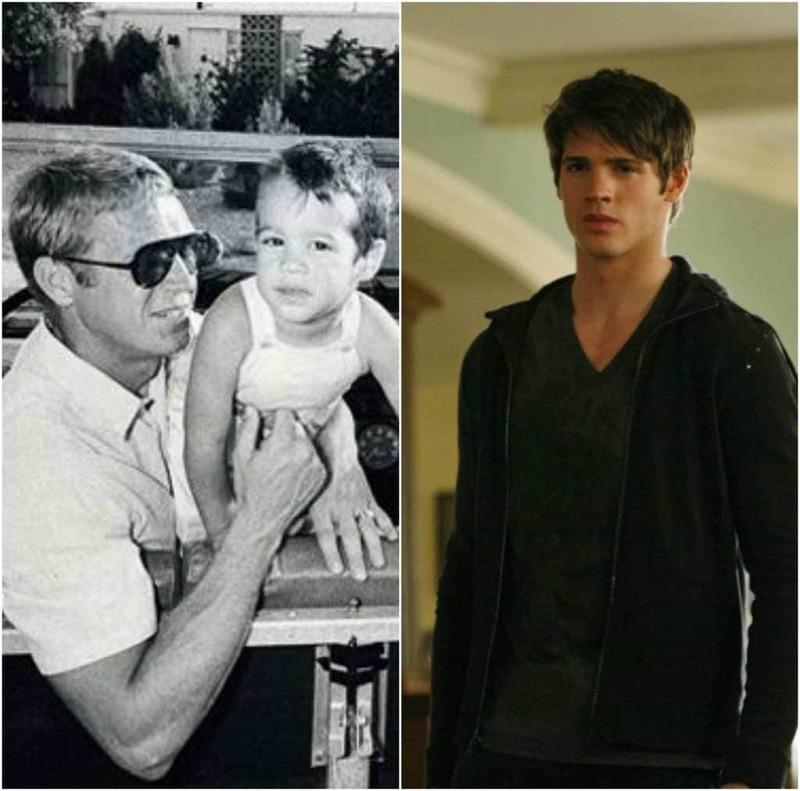 McQueen’s grandson, Steven R. McQueen, not only shares his name but also his attractive features and acting talent. You may recognize him for his roles in hit TV shows such as, The Vampire Diaries and Chicago Fire. Gregory Peck is probably most known for his iconic portrayal of Atticus Finch in the film, To Kill A Mockingbird. 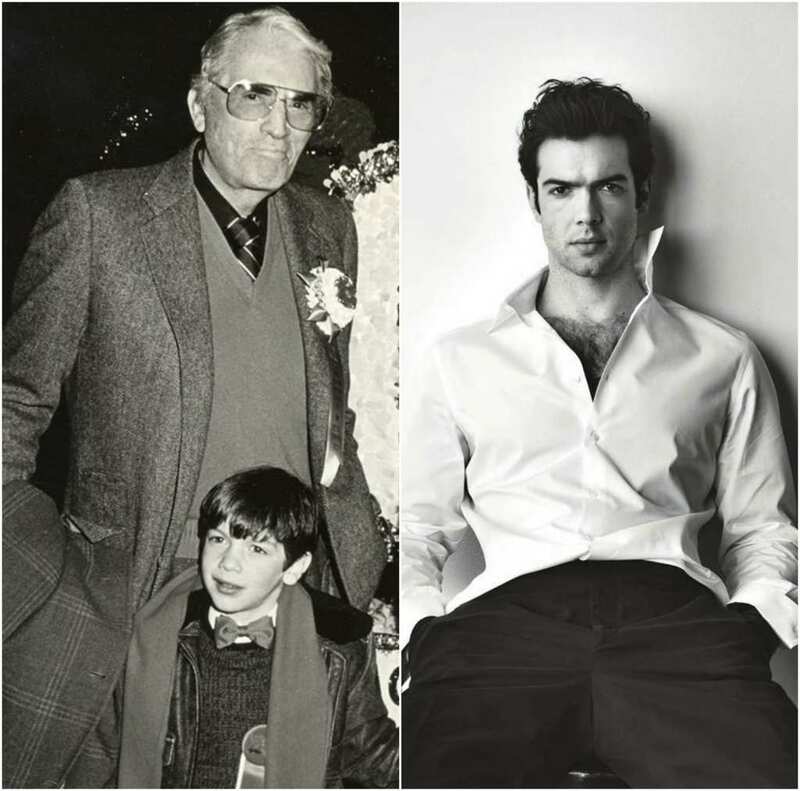 Gregory’s grandson, Ethan Peck, made a name for himself as an actor in several TV shows, including the TV adaptation of 10 Things I Hate About You. In the ABC Family show, Ethan played the character of Patrick Verona, who was first portrayed in the film version by the late Heath Ledger. Jacqueline Kennedy Onassis, is known as being one of the most stylish and beautiful first ladies in history. Jacqueline, who was also known as “Jackie O” was married to President John F. Kennedy until he was assassinated in 1963. 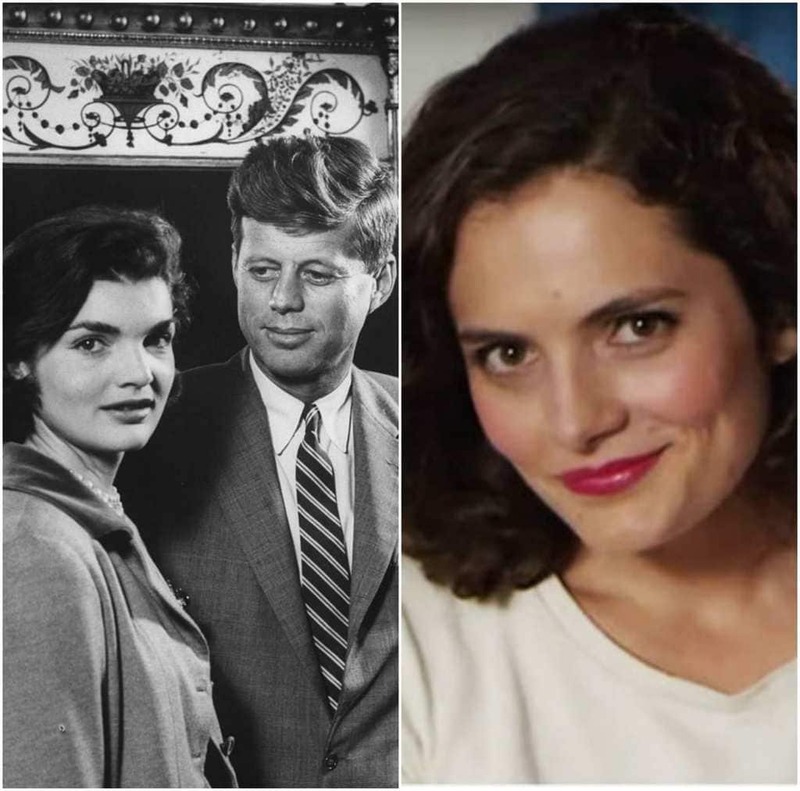 Jackie’s granddaughter, Rose Kennedy Schlossberg, holds almost a striking resemblance to her iconic grandmother. The 29-year-old doesn’t only share her stunning looks but also her ambition. A Harvard graduate and comedy actress in her own web series, Rose is a force to be reckon with. Grace Kelly had a fairytale life. 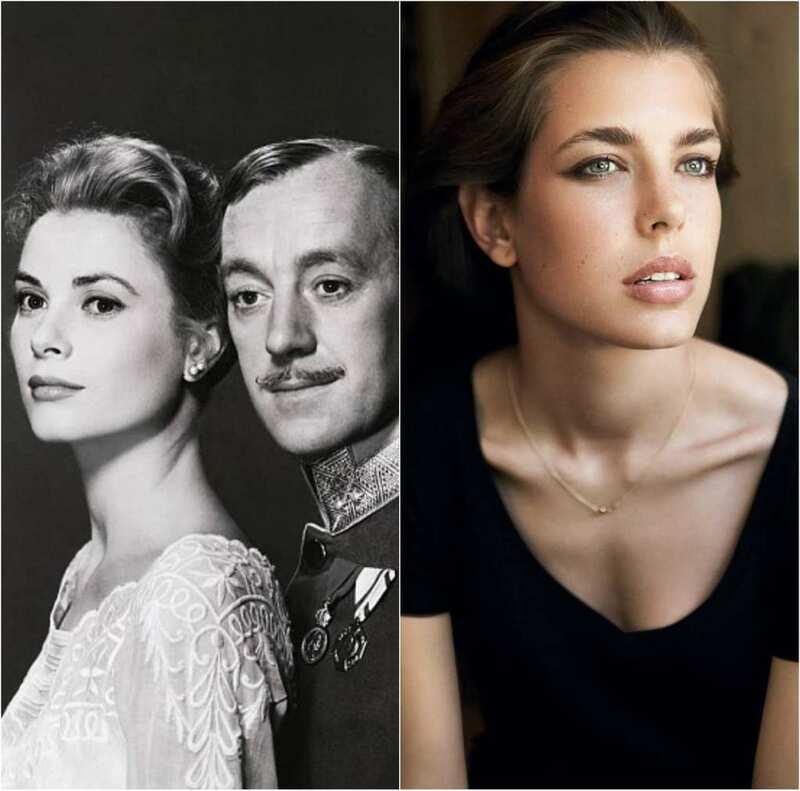 She went from being one of Hollywood’s biggest movie stars to becoming Princess of Monaco after marrying into royalty in 1956. Her granddaughter, Casiraghi, is no different. The 31-year-old follows in her grandmother’s charitable footsteps by raising funds for the Princess Grace Foundation, which provides scholarships and fellowships for aspiring artists in theater, film and dance. She, like her grandmother, is living a life of royalty and is ninth in line to the throne of Monaco. 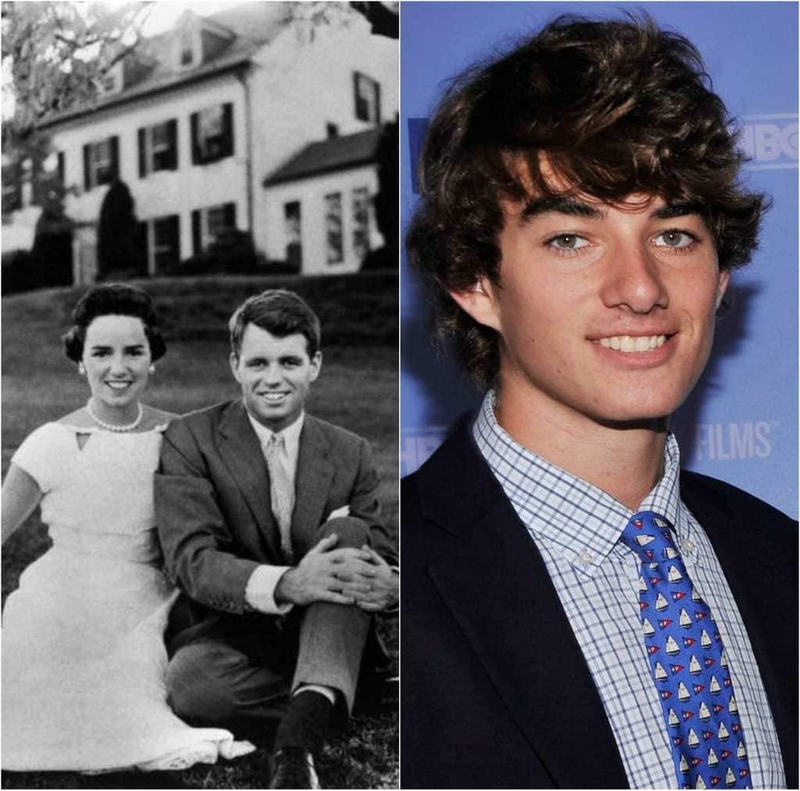 Another Kennedy on this list is Robert F. Kennedy, or “Bobby.” He was the brother of President John F. Kennedy and a US senator until his own assassination in 1968. Bobby’s grandson is now all grown up with a bright future ahead of him. He is currently studying environmental science at Harvard, but you may know him best for dating Taylor Swift. Swift bought her $5 million mansion in Cape Cod right next to his family’s summer home after only a couple months of dating. The handsome Aussie-born actor Errol Flynn made it big in Hollywood during the 30s and 40s. He was known for his romantic roles that he would often play alongside the gorgeous movie actress, Olivia de Havilland. 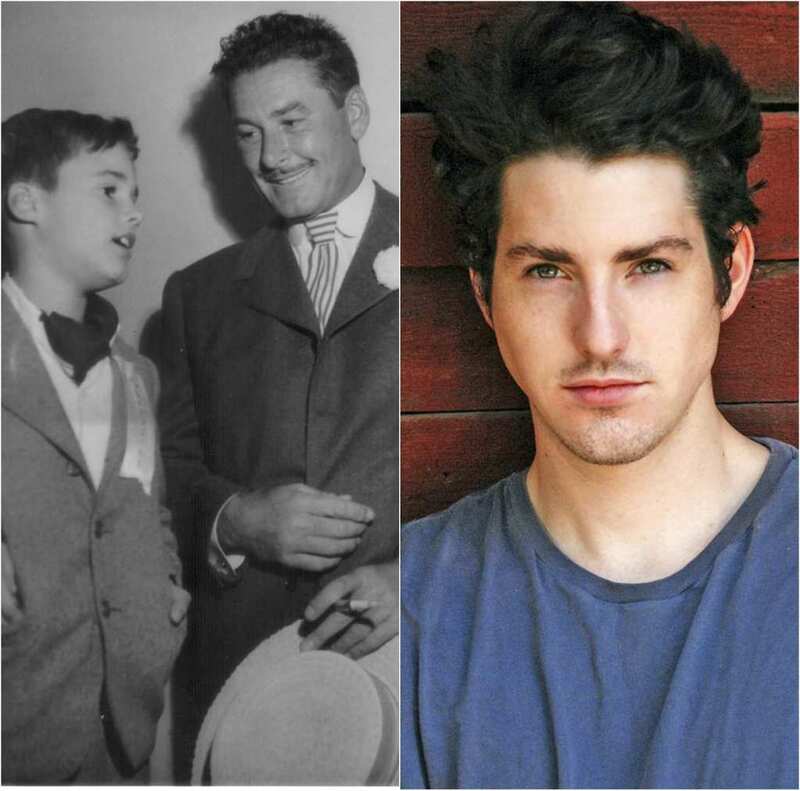 Flynn’s grandson, Sean Flynn, is an actor himself and was most well known for his role on the Nickelodeon show, Zoey 101. Since Zoey 101, the 28 year-old has been focusing less on acting and more on his guitar and songwriting skills. Clark Gable or “The King of Hollywood,” who peaked in the 30s and 40s, starred in roles that often portrayed rebellious or carefree characters. He was most well known for his legendary performance of Rhett Butler in the classic film, Gone With the Wind. 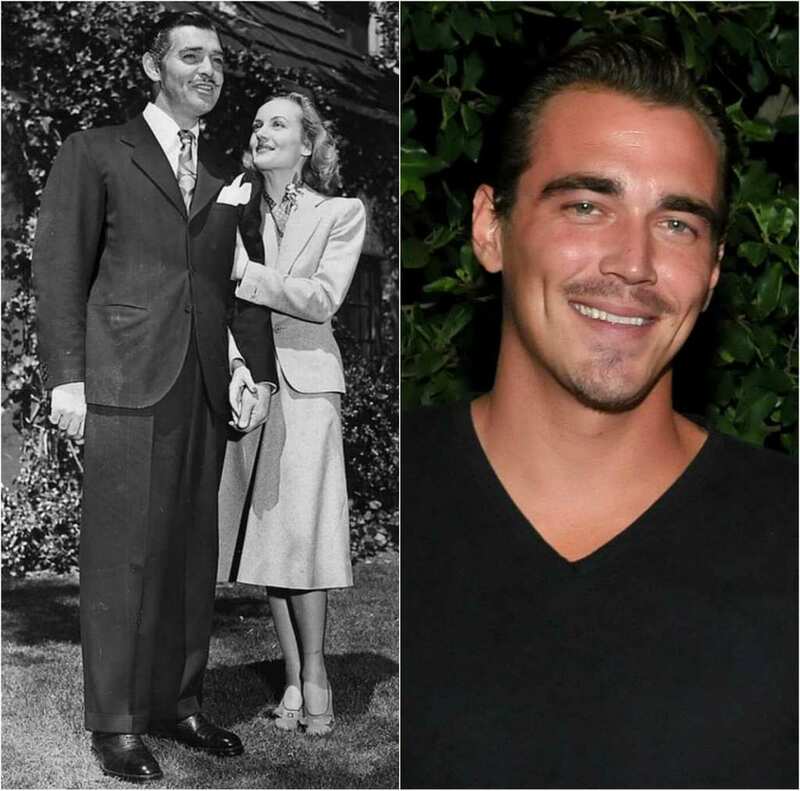 Gable unfortunately never got to meet his son or his grandson, Clark James Gable. Clark James shares his grandfather’s name and handsome looks. He is currently working as a model and TV host for the reality show, Cheaters. Henry Fonda was an actor who started his career on Broadway until he paved his way to Hollywood. He is most well-known for his performance as Tom Joad in The Grapes of Wrath which gained him an Academy Award nomination. 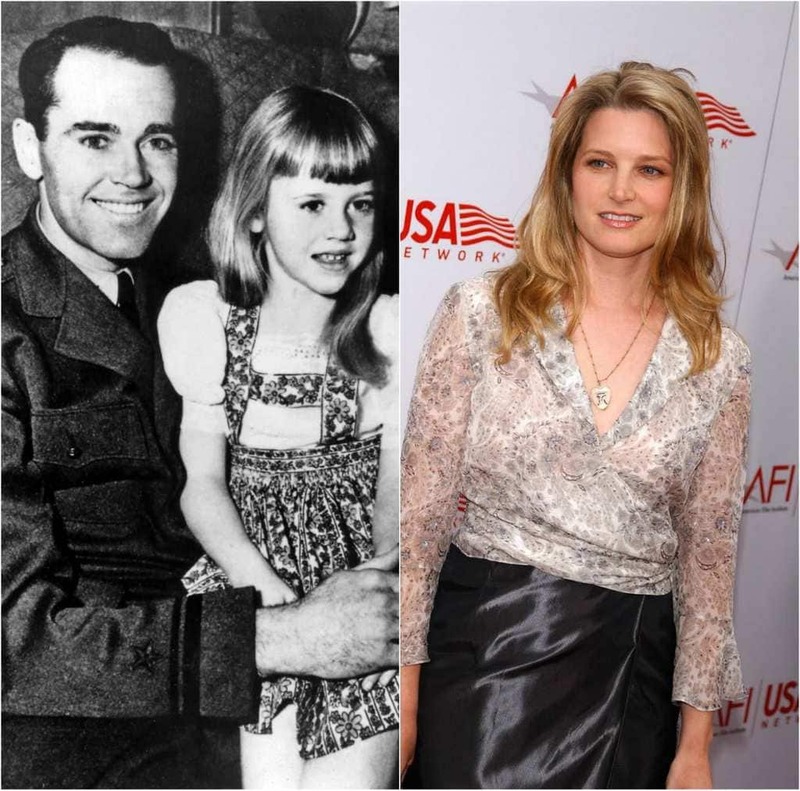 Fonda’s granddaughter, Bridget Fonda, has since retired from acting, but played roles in films such as The Godfather Part III and Single White Female. She is now keeping her and her family out of the limelight. Audrey Hepburn was a British movie star and style icon who performed in several classic films of the 50s and 60s such as Breakfast at Tiffany’s, Roman Holiday and My Fair Lady. Emma Kathleen Ferrer definitely has her grandmother’s sense in style and stunning looks. She is currently following in her grandmother’s fashion forward footsteps and is working as a model. 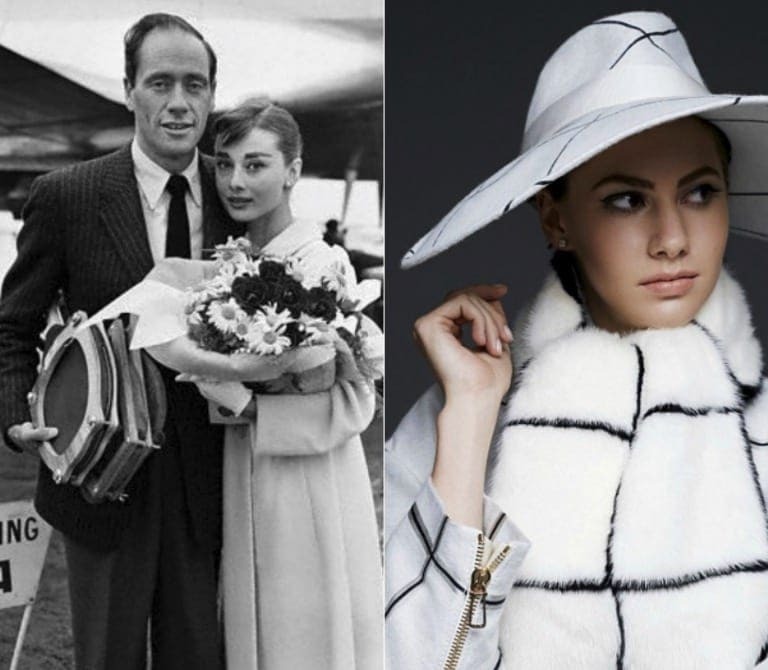 If she looks familiar, it may be because she recently graced the cover of Harper’s Bazaar in a very Audrey Hepburn-esque outfit. Elia Kazan was named by The New York Times as “One of the most honored and influential directors in Broadway and Hollywood history.” He directed some of the most respected films of all time including A Streetcar Named Desire and East of Eden. 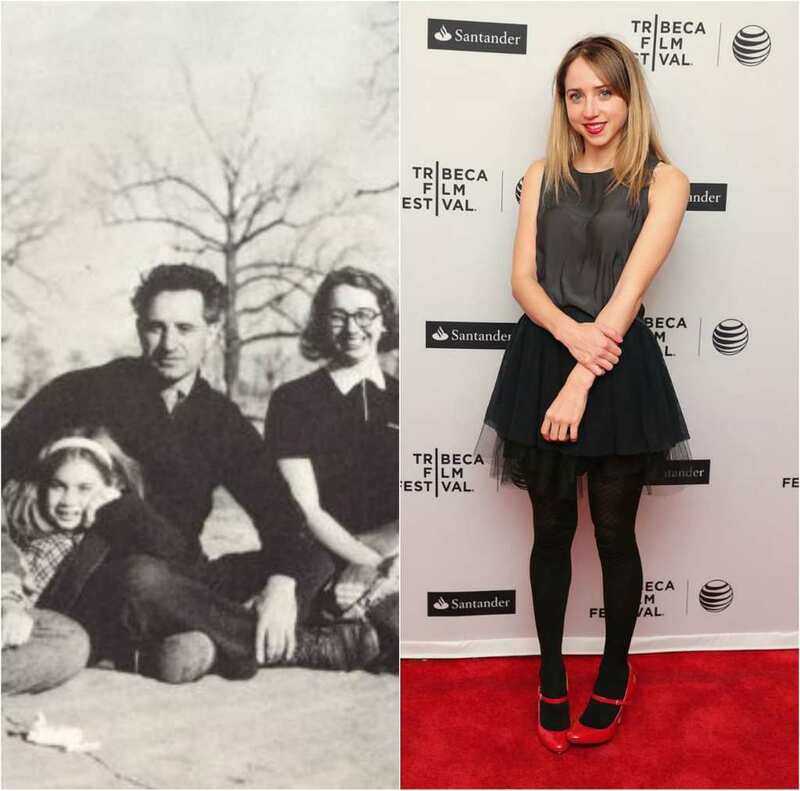 It is no wonder why his granddaughter, Zoe Kazan, seems to be all over the big screen nowadays. She is not only a successful actress, but a playwright as well currently co-writing the upcoming film, Wildlife starring Jake Gyllenhaal. Paul Burke was an actor most well-known for his role as detective Adam Flint on the 60s ABC TV show Naked City, which gained him an Emmy nomination. Burke’s granddaughter, Alia Shawkat, is also no rookie to TV. Shawkat starred as the sarcastic Maybe in the cult-comedy, Arrested Development where she played alongside Michael Cera and Jason Bateman. Shawkat’s most recent success comes from acting in and producing the new dark comedy show, Search Party. Besides acting, Shawkat enjoys traveling and going on adventures. Charlie Chaplin had one of the most successful acting careers of all time. He proved himself as a legendary comedian and filmmaker who became famous during the silent film era of the 20s-40s. 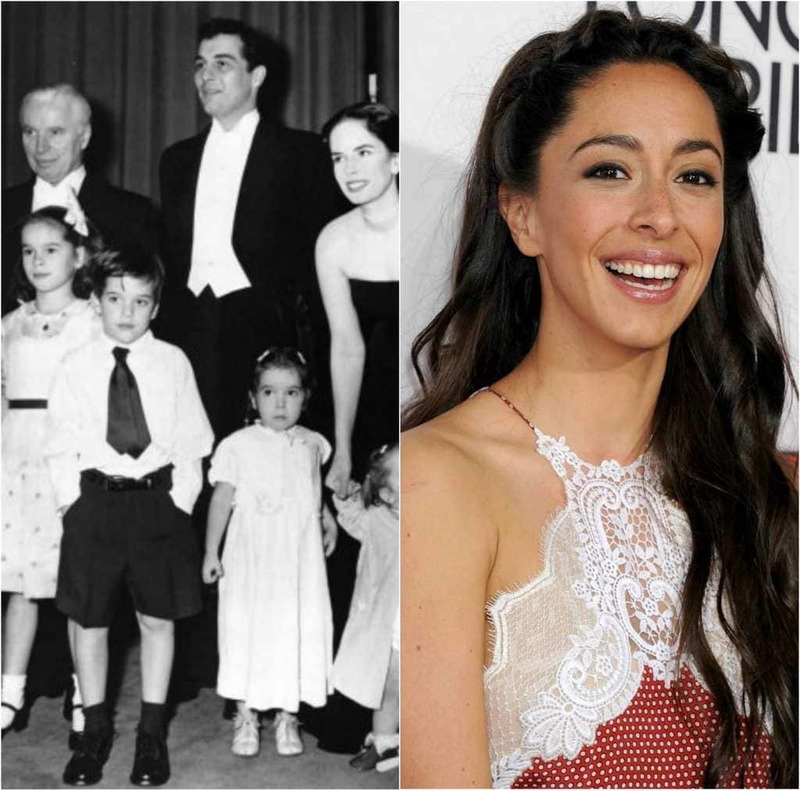 You may not have known that his granddaughter, Oona Chaplin, is also making herself known as a talented actress. She was most recently seen as Talisa Maegyr on the hit HBO series, Game of Thrones. She will also be starring in the next Avatar movie. Jack Cassidy was a Tony-Award winning Broadway star who was known for his musical performances in shows such as She Loves Me and Wish You Were Here. His talent didn’t stop on the stage, Cassidy also earned Emmy nominations for his prominent work in television. 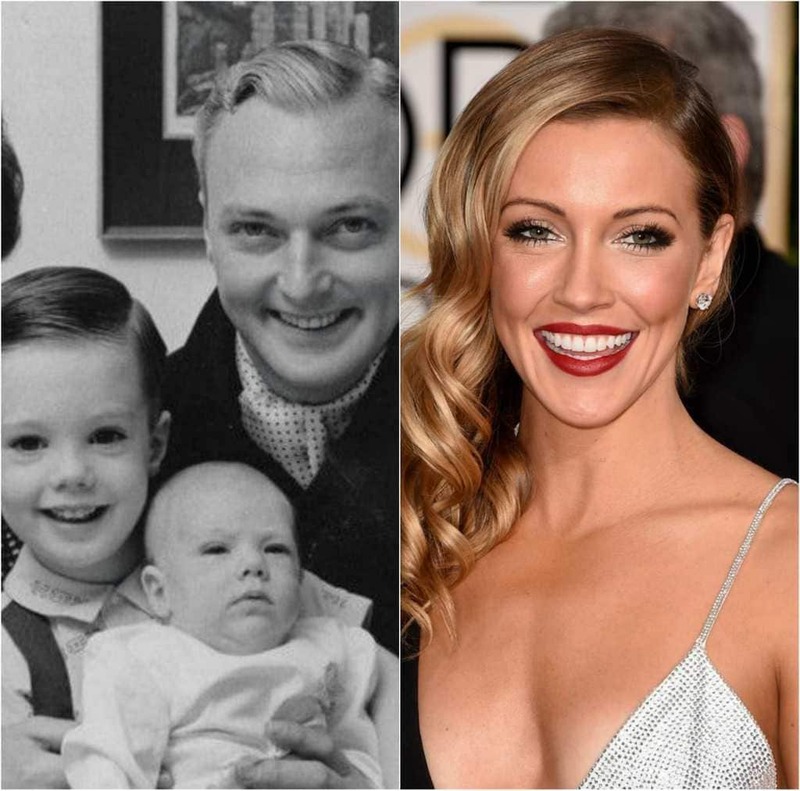 Katie Cassidy shares her grandfather’s passion and gift for acting and has appeared in various movies such as Taken, Click and When a Stranger Calls. Queen Elizabeth II has served as the Queen since 1952, making her the longest-ruling monarch in all of British history. The queen, who is now 91-years-old, has a long list of grandchildren and great-grandchildren. Her most well-known being the two handsome princes, Prince William Duke of Cambridge and and Prince Harry of Wales. 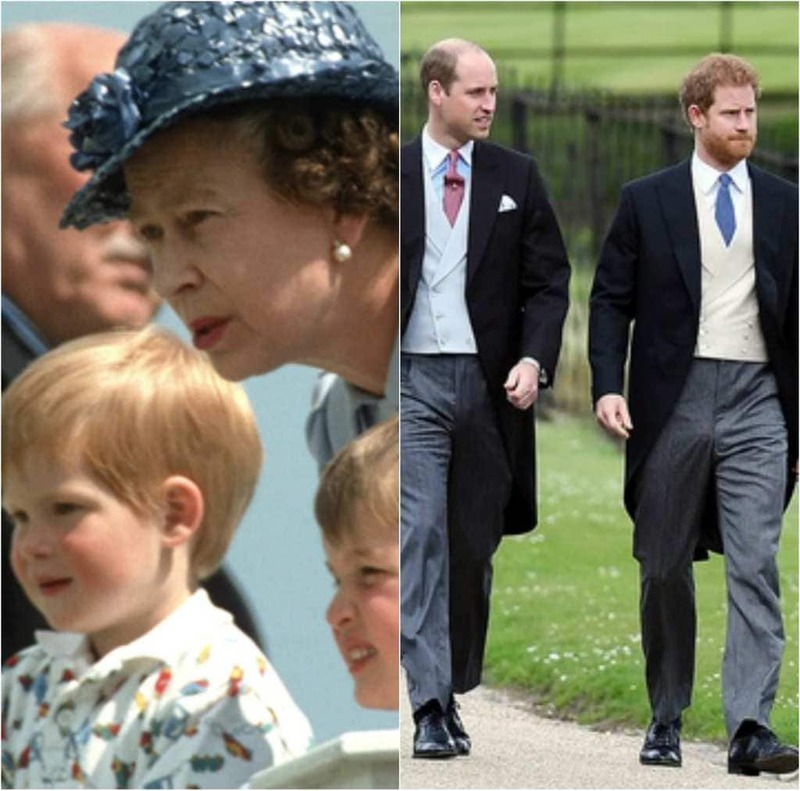 Just like their grandmother, these two princes have grown quite accustomed to a royal life under the spotlight. The Nobel Prize winner Ernest Hemingway is still seen today as one of the most influential novelists of the 20th century. He is best known for his renowned novels such as The Old Man and the Sea and A Farewell to Arms. 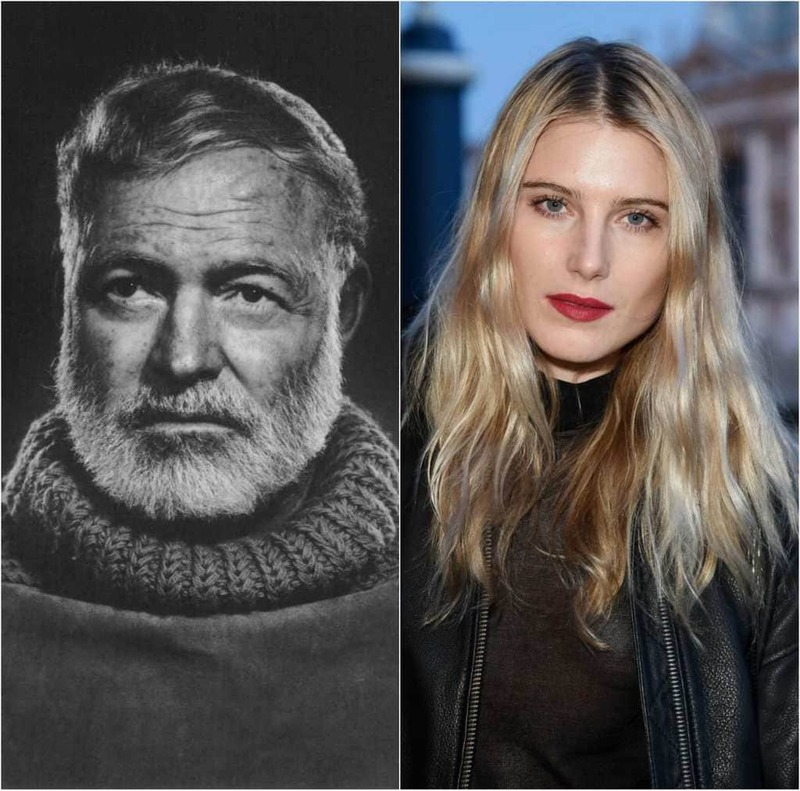 Sharing the iconic writer’s last name, Dree Hemingway, is Ernest’s great-granddaughter and is making her own mark in modeling and acting. Dree has walked for fashion giants Givenchy and Calvin Klein and most recently proved her acting skills in independent films Starlet and Live Cargo. Another famous writer on this list, Roald Dahl, was a British novelist known for telling remarkable stories. Some of his most famous works include Charlie and the Chocolate Factory, Fantastic Mr. Fox and The BFG which were all adapted into film. 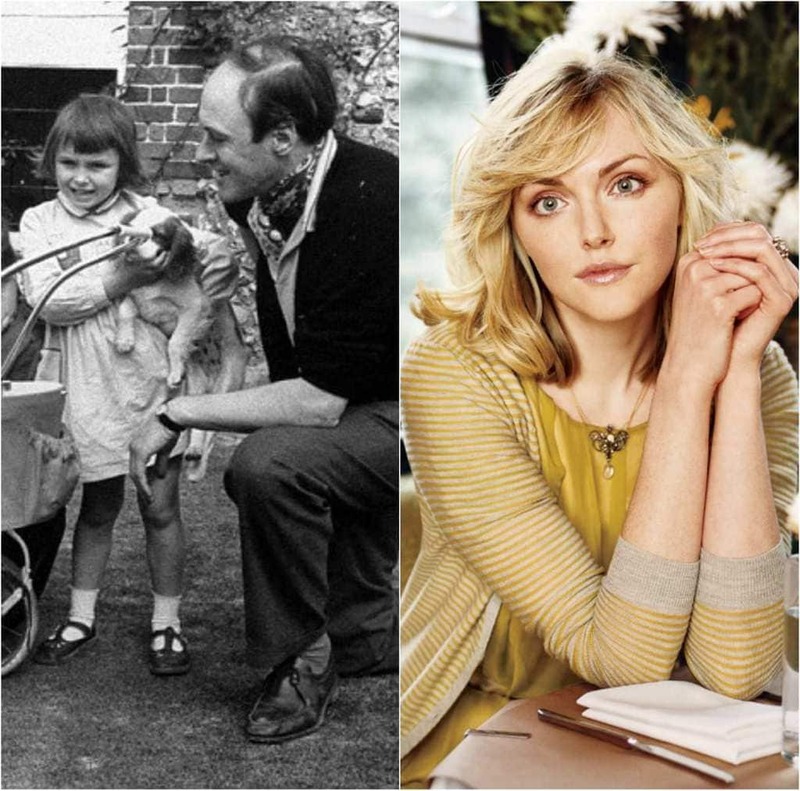 His granddaughter, Sophie Dahl, was actually the inspiration for the character of Sophie in The BFG. Sophie now is all grown up and works as a fashion model and, following in her grandpa’s footsteps, a writer. Marlon Brando is quite possibly the most respected movie star of all time. His handsome face and incredible passion graced the big screen with classic hits from A Streetcar Named Desire to The Godfather. 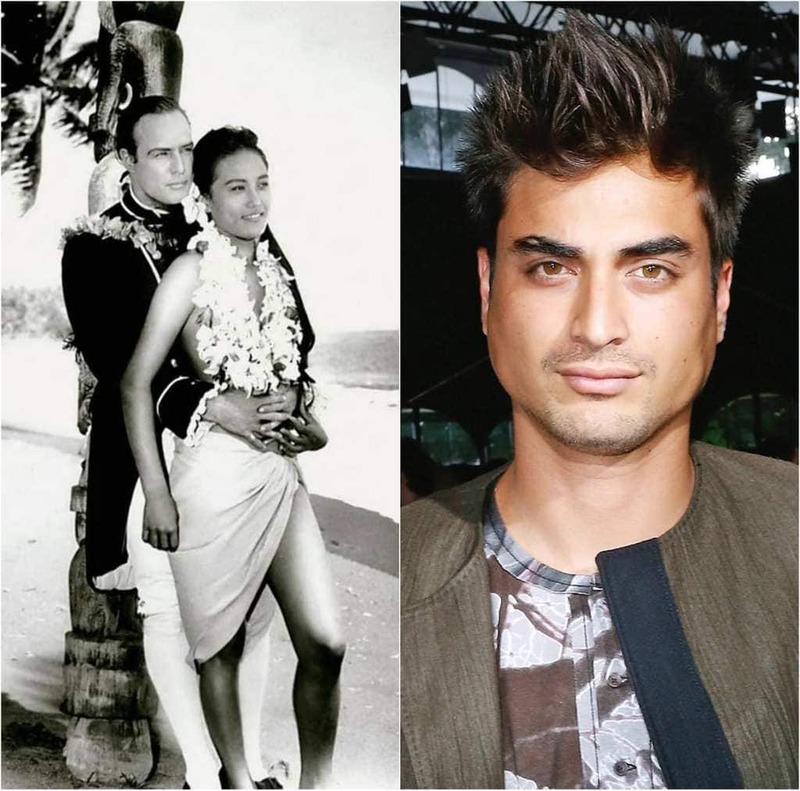 Sharing the movie icon’s good looks is Brando’s grandson, Tuki Brando. Tuki may not have followed the same path towards acting like his grandfather, but his inherited features are not going to waste. You can find Tuki modeling as the face of Versace menswear. Alain Delon is a French actor who was one of the most well acclaimed actors in Europe during the 60s. 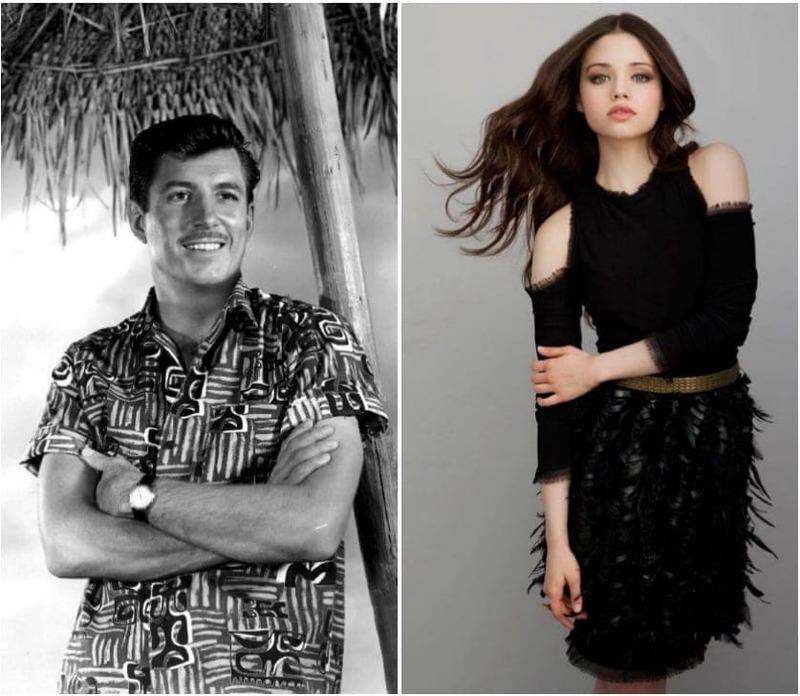 He was known as a “pretty boy” and as one of the “best looking actors of all time.” It is no surprise that his granddaughter, Alyson Le Borges, is also so easy on the eyes. The 31-year-old is now working as a model and actor, starring in the French film The Blue Island. Sports fans will, without a doubt, recognize this grandfather. Wellington Mara co-founded the NFL team, the New York Giants, in 1959. He is still admired today as of of the most iconic sports figures in NFL’s history. His granddaughter, Kate Mara, did not follow him in a life of sports, but instead a life in Hollywood. Kate is recognized most from her role as Zoe Barnes in the political drama series House of Cards, but has been in a large array of films and TV shows. Berry Gordy Jr. was a music producer, songwriter and detrimental part to R&B music. He founded the Motown record label in 1959 which represented major artists from Marvin Gaye to Michael Jackson. 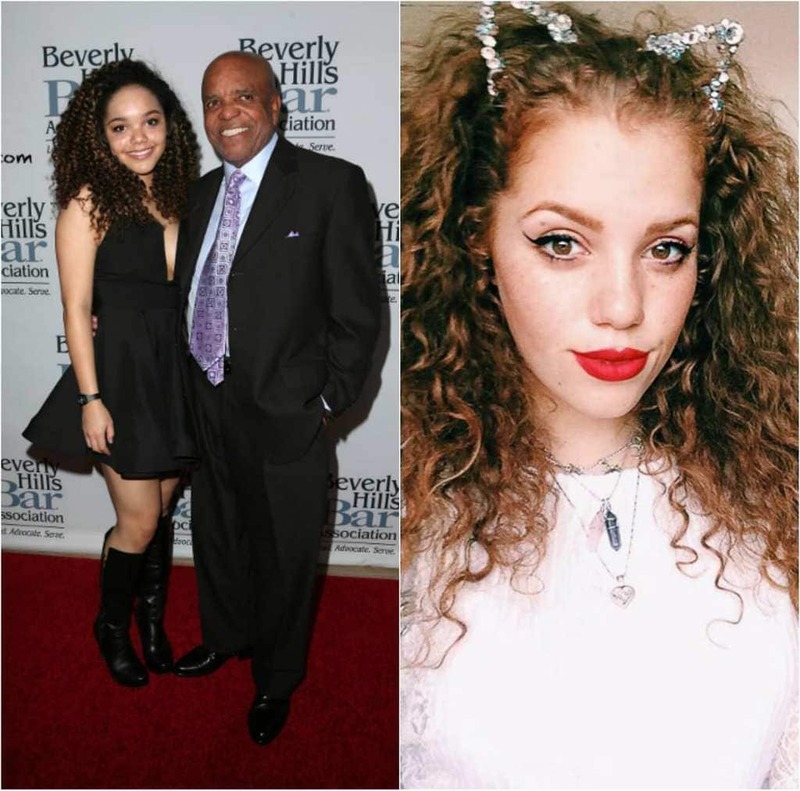 Gordy’s granddaughter is now 22-years-old and working as a musical artist herself. The talented singer is a social media queen and has millions of followers on YouTube and Vine. She recently went on tour with the band Fifth Harmony. 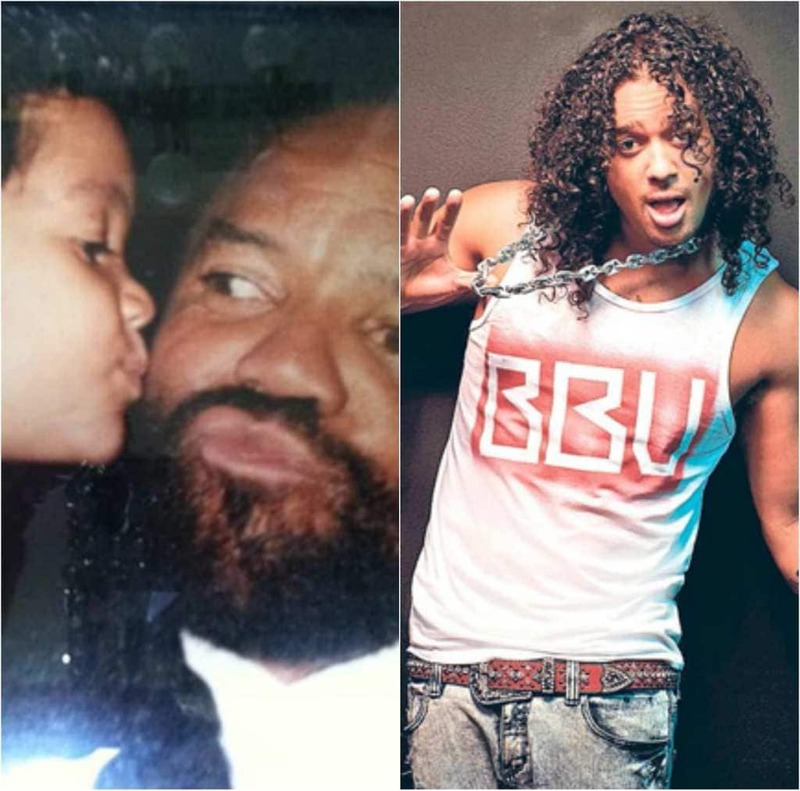 Another one of Gordy’s grandchildren to make this list is Skyler Austen Gordy or Sky Blu. Like his sister and grandfather, Sky decided to follow the family tradition of working in the music industry. Sky Blu and his uncle Redfoo, perform together as the popular electronic dance music duo, LMFAO. The duo are known for their popular dance hits Party Rock Anthem, Shots and Sorry for Party Rocking. In her 20’s, Tippi Hedren was one of the top fashion models of the time. She graced the covers of Life and Glamour until the iconic horror film director, Alfred Hitchcock, discovered her. Thanks to Hitchcock, Hedren became a movie star and got casted in big iconic films. She is probably most known for her role in Hitchcock’s The Birds. Tippi Hedren’s granddaughter launched her career by modeling as well. You might recognize her as Mr. Grey’s love interest in Fifty Shades of Grey. Roxie Roker is known for playing Helen Willis on the popular CBS sitcom, The Jeffersons. Helen made headlines with her costar, Franklin Cover, by becoming the first ever interracial couple on television at the time. Roker’s granddaughter Zoe Kravitz, also the daughter of rock star Lenny Kravitz, is a success in her own. She has a pretty impressive resume that includes playing alongside Nicole Kidman and Reese Witherspoon in the new HBO drama series Big Little Lies. When it comes to Hollywood history, Samuel Goldwyn is kind of a big deal. He produced films with his partner/brother-in-law with Paramount Pictures when they were just a tiny film studio start-up. 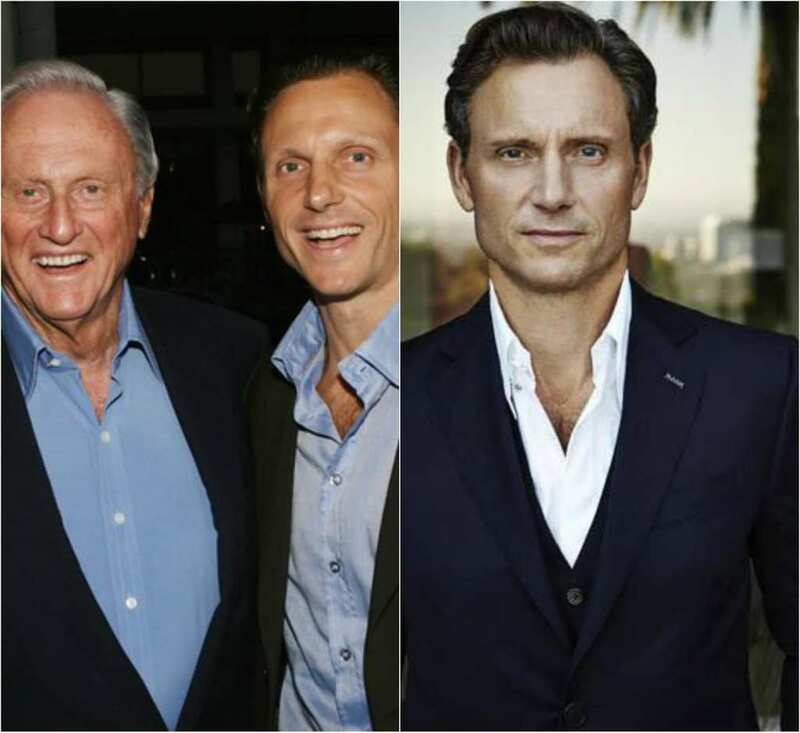 Goldwyn’s grandson Tony Goldwyn has quite a long list of TV shows and movies under his belt including the 90s film, Ghost. Now he is currently playing the role of President Fitzgerald Grant on the popular thriller series, Scandal. Debbie Reynolds was an icon of Hollywood in the 1950s, with her most notable performance being in Singin’ in the Rain. She was charming and vivacious, landing major roles soon after being discovered. 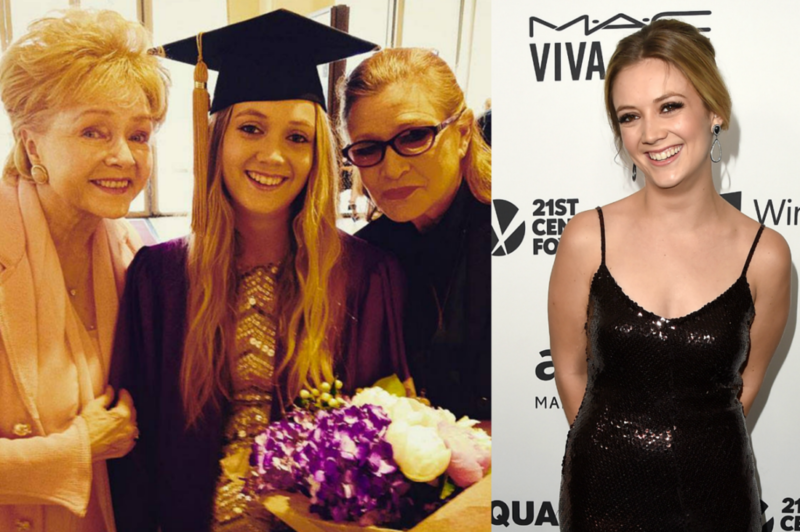 Billie Lourd, Debbie’s granddaughter and the daughter of Carrie Fisher, is an actress in her own right, and she clearly inherited her grandmother and mother’s good looks. She is mostly recognized for her roles in the tv shows “Scream Queens” and “American Horror Story”. Both Fisher and Reynolds died in 2016, within a day of each other. Academy Award-winner Francis Ford Coppola is a famous director, producer, scriptwriter… He is the patriarch of the famous filmmaking family, the Coppolas. He is most famous for The Godfather films, as well as other iconic films like “Apocalypse Now” and “Patton”. 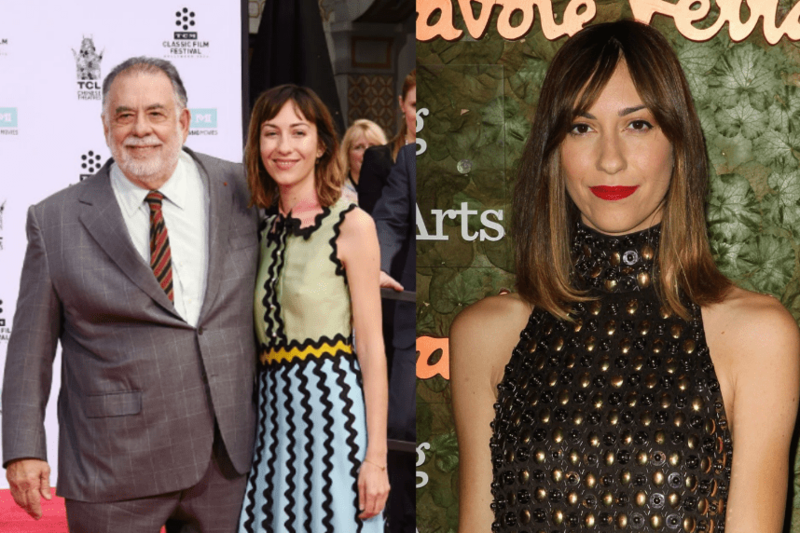 His granddaughter, Gia Coppola, is also a filmmaker; specifically a director and screenwriter, as well as an actress. She is only getting started in the industry, but her few submissions to various festivals received positive reviews. Albert Einstein. His work is so renowned that no additional information is needed to introduce Einstein but his name. His surname is even synonymous with intelligence. He developed the theory of relativity, which is the basis for research in physics today. 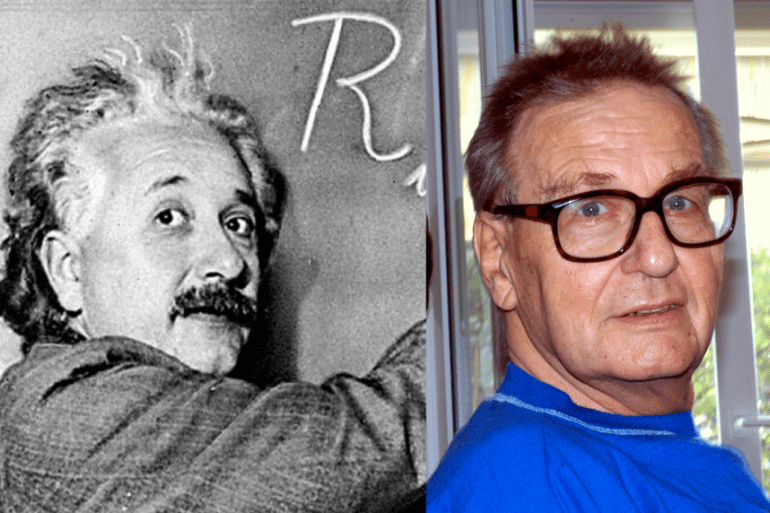 Bernard Caesar Einstein, one of Albert’s grandsons, was a successful engineer, who lived in Switzerland most of his life. He had several patents to his name, mainly in the field of light amplification, designated to improve night-vision devices. Kirk Douglas is one of the oldest actors alive today. At the age of 100, he has a long list of acting credits to his name, both on stage and in film. 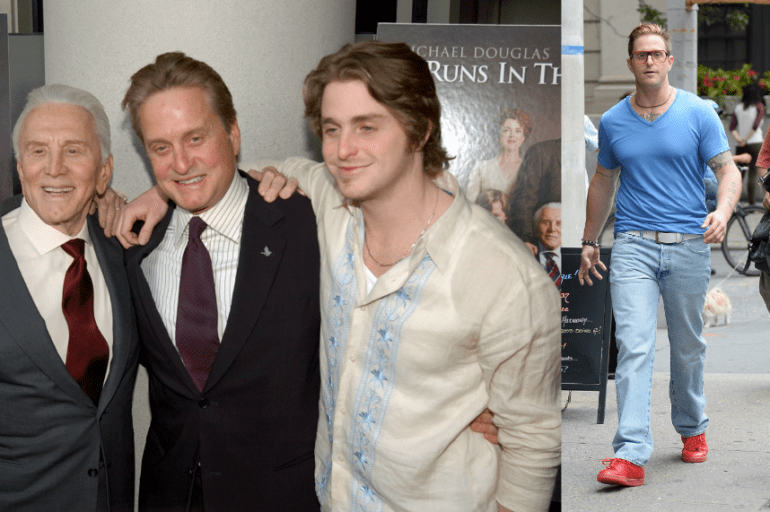 He passed the acting bug to his son, actor Michael Doulas, and it seems to have also passed to his grandson, Cameron Douglas. Cameron has been involved in several films over the years; however, seeing as he has had legal troubles over the past few years, it has been a while since his last acting job. George H. W. Bush was the 41st President of the United States. He was also Vice President, the US ambassador to the United Nations, Director of Central Intelligence, and much more. He has had many successes in his life. His son, George W. Bush, had twin daughters, one of whom, George Sr’s granddaughter Jenna Bush Hager, is a well-known writer and reporter. She was also a teacher and interned at UNICEF. Clearly, a busy and successful person, like her grandfather. James Brolin is a very talented actor, mostly familiar for his work in film and tv in the 1970s. In the 21st century he has appeared mostly in supporting roles, on Castle, Community, Catch Me If You Can, and The West Wing, and many other productions. He is also well-known for being married to Barbra Streisand. 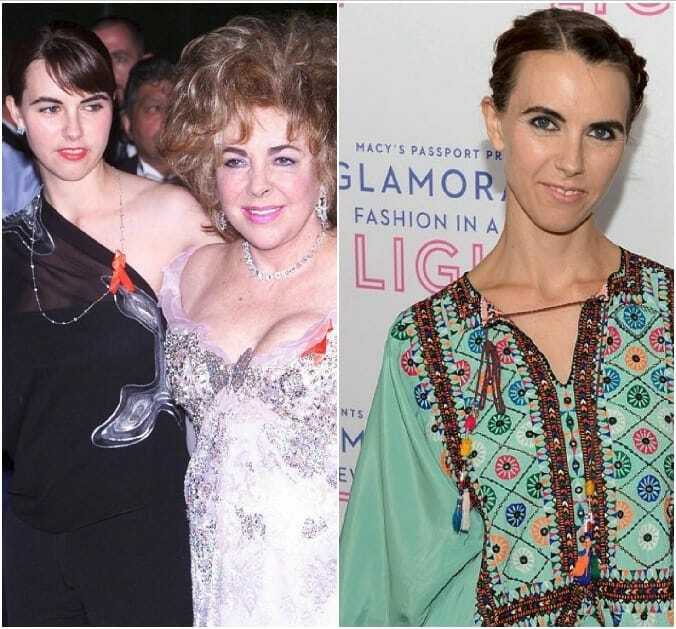 His granddaughter, Eden Brolin, is also an actress, mostly known for her roles in the TV show Beyond, and in Manson’s Lost Girls. Donald Sutherland was a superstar in 1960s and 1970s, famous for his roles in M*A*S*H, Animal House, The Dirty Dozen, and many more. He still manages to land spectacular roles today, in his 80s. For example, he played the character of President Snow in the popular films The Hunger Games, to positive reviews. He received an Honorary Oscar in 2017. Sarah Sutherland, his granddaughter, is a very popular actress in her own right. She is most well-known for her role as Catherine Meyer in Veep, and has appeared in many other popular productions. 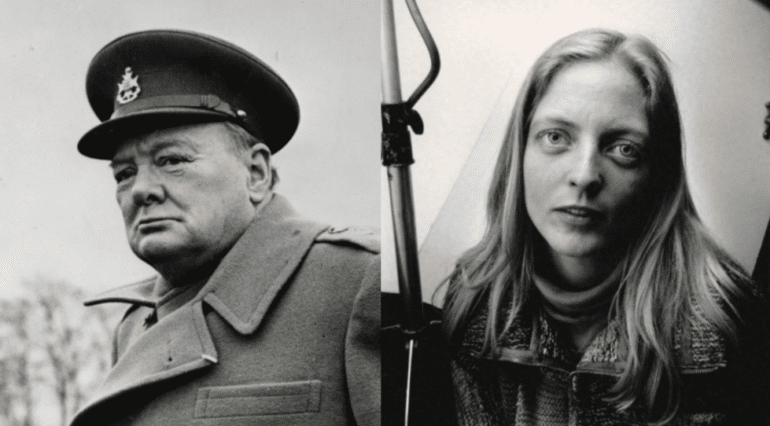 Winston Churchill was a hero of WWII. He served as the Prime Minister of the United Kingdom after Neville Chamberlain’s resignation. He was an inspiration to the British troops and citizens for four years, until Germany’s surrender in 1945. He left a glorious legacy. His granddaughter Arabella had a passion for charitable work, as well as music and theater. She is mostly known as the founder of the Glastonbury Festival, as well the Children’s World charity. Nelson Mandela was the leader of the anti-apartheid revolution in South Africa. He served as the President of South Africa for five years. During his term in office, his government’s main focus was on dismantling institutionalized racism. He is one of the most famous activists in history. 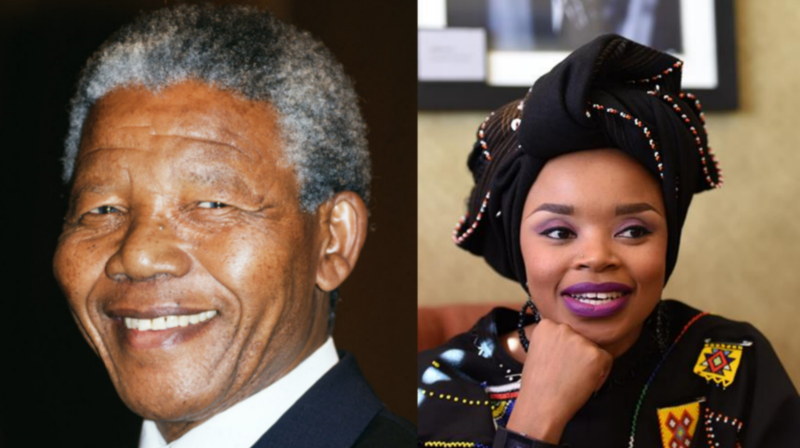 His granddaughter, Zoleka Mandela, is an activist herself, and a well-known writer. She inspired many with her writings about her experiences with substance abuse, as well as with cancer. 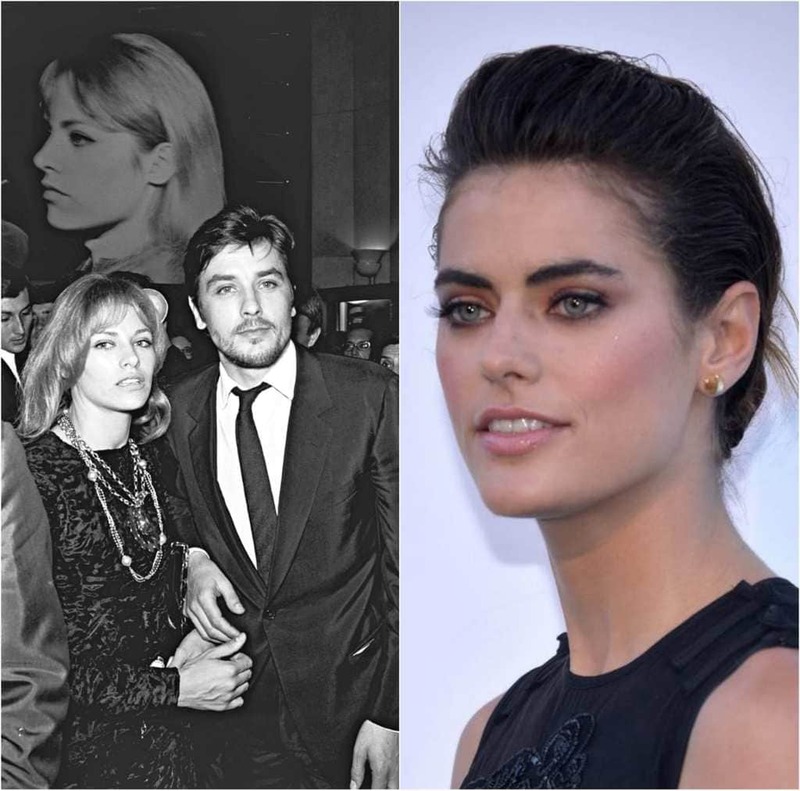 Another one of Tippi Hedren’s gorgeous granddaughters to make the list is the 21-year-old younger sister to Dakota Johnson, Stella Banderas. Just like her older sister, mother (Melanie Griffith) and father (Antonio Banderas), Stella wishes to get into the acting business. Although her only acting credit so far is the in 1999 film directed by her father Crazy in Alabama, the young beauty is planning on making a comeback soon so… look out! Paul McCartney truly needs no introduction, seeing that he was the singer for the most famous rock band to ever exist, The Beatles. 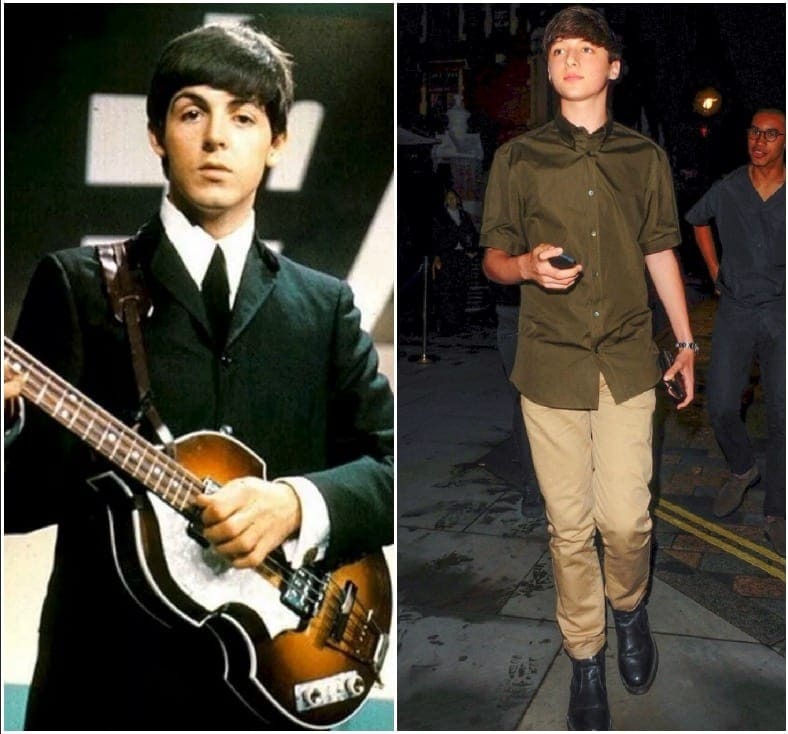 Paul’s 18-year-old grandson Arthur has been living a much more private life than his grandfather, although he is still followed by paparazzi for his incredibly close resemblance to a young Sir Paul. Arthur has decided to stay away from the world of music and is currently a student at Yale University. Another Beatles grandchild on this list.. Tatia Starkey is the 31-year-old granddaughter to the talented drummer. Tatia, following in her grandfather’s musical footsteps, is a singer and bass player for the UK band Belakiss. 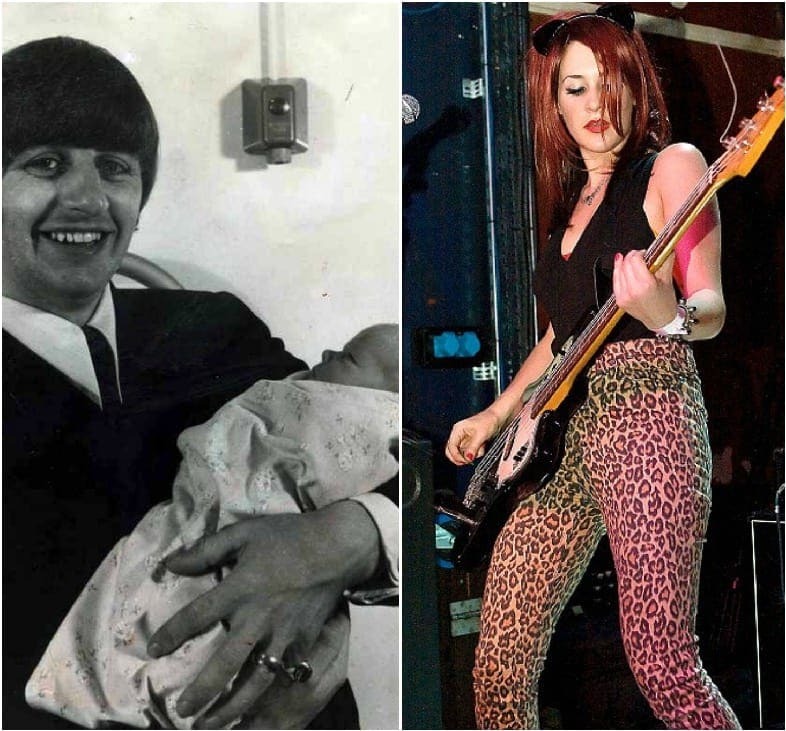 Last year, she gave birth to Ringo’s first great-grandchild, a boy named Stone, with her husband Adam Low. Tatia’s grandfather is not the only one she gets her musical genes from however, her father is Ringo’s son Zak Starkey, also a famous drummer for The Who and Oasis. Lloyd Bridges was a movie star who became famous in the ’40s for his roles in films such as A Walk In The Sun, Sahara and High Noon. He continued to act up well through the ’80s and ’90s and appeared in mostly comedic roles such as Airplane! and Hot Shots!. Now, his grandson is walking in his footsteps and living up to his legacy! 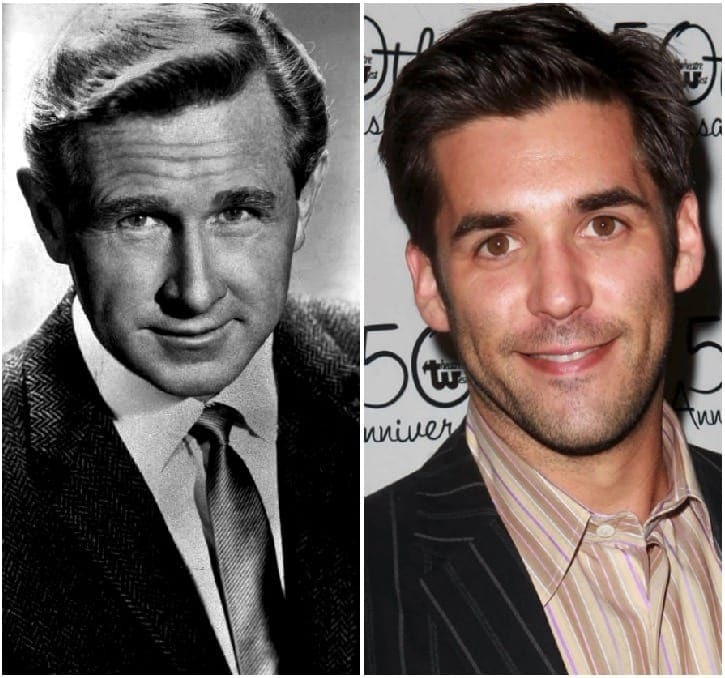 Jordan Bridges is an actor just like his grandfather and is known for playing Frankie Rizzoli Jr. in the TNT series Rizzoli & Isles. And yes, if you were wondering, he is related to Jeff and Beau Bridges, Beau is his father and Jeff is his uncle- so pretty much he was destined for fame! John Carradine first became famous in the 1940s when he appeared in films such as The Grapes of Wrath and Stagecoach. He worked right up until the mid ’90s in mostly horror films or Westerns. He passed away at the age of 82 in 1988. John’s granddaughter is following a similar path as her late grandfather and has been acting since the late ’90s. She has been in several films and TV shows and most recently appeared as Naomi in The Handmaid’s Tale. Patty Duke started her career at a young age, and by the time she was 16-years-old she had already won an Oscar for her role as Helen Keller in the 1962 film, The Miracle Worker. The very next year she was given her own show, The Patty Duke Show. She continued to work up until 2015, a year before her death. Ali is also an actress, who made her acting debut at the age of 6 with her father Sean Astin in The Lord of the Rings: The Return of the King. She most recently appeared in the horror film Bad Kids of Crestview Academy. Bob Elliott was a comedian who was most famous for being one half of the comedy duo Bob and Ray with fellow comedian Ray Goulding in the ’50s. He went on make several appearances in shows like Saturday Night Live, Get a Life and King of the Hill. He passed away after a long and successful life in 2016. 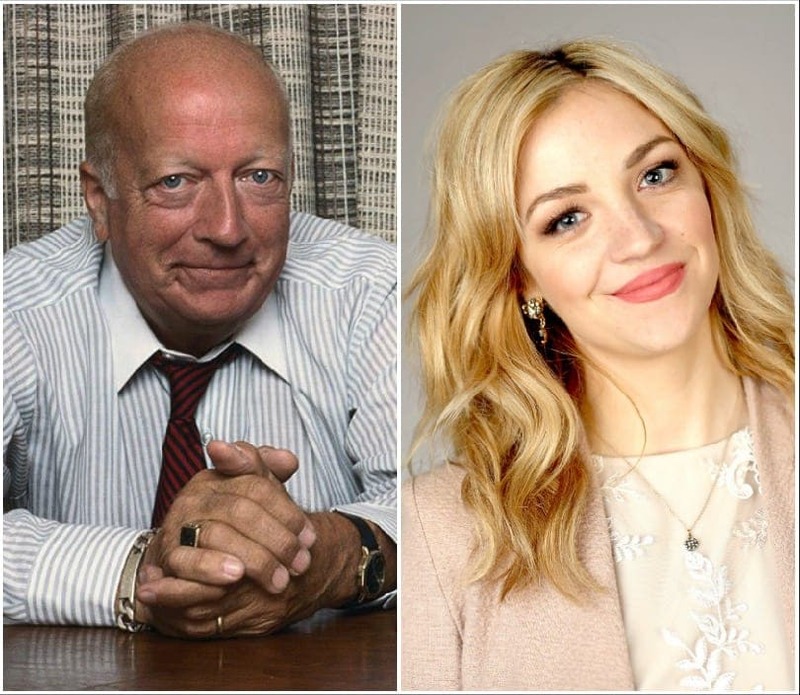 Living in his comedic legacy is his granddaughter Abby Elliott, who, like her grandpa, appeared on Saturday Night Live. She was on the show for 4 years until moving on to other series and films. She recently has been starring as Brooke in the series Odd Mom Out. 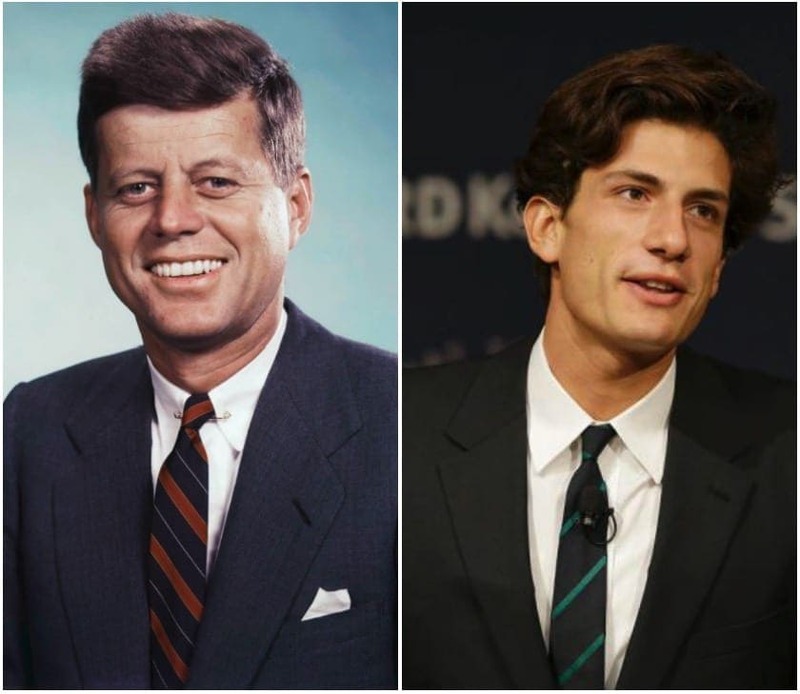 Another Kennedy to make it on this list is JFK and Jackie O’s only grandson, John Schlossberg. The 24-year-old Yale grad has a bright future ahead of him, and is currently studying at Harvard Law School. He is already making quite a name for himself and founded a non-profit organization that provides florescent light bulbs for low-income families when he was only in the eighth grade. He also holds a remarkably close resemblance to his late grandfather if we do say so ourselves. Anthony Eisley was an actor who was known as playing detective Tracy Steele in the ABC series from the early 1960s, Hawaiian Eye. His granddaughter India has chosen the same career as her late grandfather and is doing pretty well so far. Her most popular role was as Ashley Juergens in the series The Secret Life of the American Teenager. She most recently appeared in the Netflix thriller film Clinical, where played one of the lead roles. Elvis Presley was known as the “King of Rock and Roll.” He is considered as one of the greatest musical icons of the 20th century. Presley was easy on the eyes and ears, and made headlines with his controversial dancing which some found as “inappropriate” at the time. 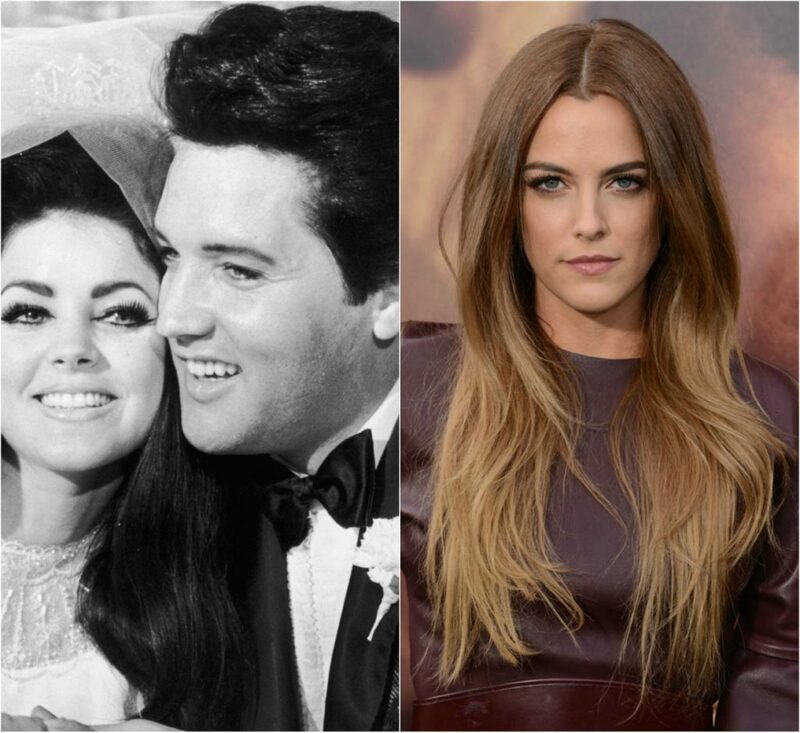 Living in his legacy is his granddaughter Riley Keough, who holds a remarkable resemblance to her late grandpa. Riley is paving her own road to success however, and has pursued a career in acting. She recently played the role of Capable in the Acadamy Award winning film, Mad Max: Fury Road.